You are given two integers A and B. Let the size of the grid be h \times w (h vertical, w horizontal). Both h and w are at most 100. The set of the squares painted white is divided into exactly A connected components. The set of the squares painted black is divided into exactly B connected components. It can be proved that there always exist one or more solutions under the conditions specified in Constraints section. If there are multiple solutions, any of them may be printed. 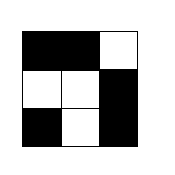 Two squares painted white, c_1 and c_2, are called connected when the square c_2 can be reached from the square c_1 passing only white squares by repeatedly moving up, down, left or right to an adjacent square. Any two squares in S are connected. No pair of a square painted white that is not included in S and a square included in S is connected. A connected component of squares painted black is defined similarly. In the first line, print integers h and w representing the size of the grid you constructed, with a space in between. If the square at the i-th row and j-th column (1 \leq j \leq w) in the grid is painted white, the j-th character in s_i should be .. If the square at the i-th row and j-th column (1 \leq j \leq w) in the grid is painted black, the j-th character in s_i should be #.